The Plant GeneSet Enrichment Analysis Toolkit (PlantGSEA) is an online websever for gene set enrichment analysis of plant organisms developed by Zhen Su Lab in China Agricultural Unversity. We developed this to meet the increasing demands of unearthing the biological meaning from large amounts of data. 1.We collect totally 20,290 gene sets form different resources, such as public database, computational prediction, literature etc. which are all from plant species. These gene sets are divided into 4 categories, including GO gene sets(G1), Gene Family Based gene sets(G2), Curated gene sets(G3), Motif gene sets(G4) and Cluster gene sets (G5) which is new added. 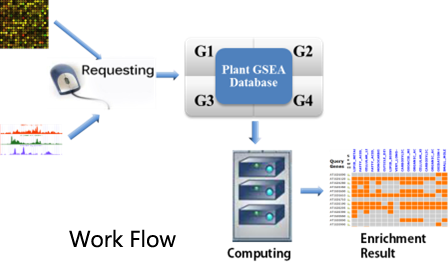 2.The PlantGSEA toolkit cater for agricultural study based on GSEA method which is a statistical computational method to extract biological meaning from a list of differential expression genes at the level of gene sets. Besides online computational prediction, the PlantGSEA further provides tools such as gene set exploration, Gene ID conversion, hierachy analysis, etc. If you have any questions, comments or suggestions about our website, please feel free to contact us: hengyuyan@cau.edu.cn, xlma@cau.edu.cn and zhensu@cau.edu.cn. 2018-7-26 The backup PlantGSEA website is http://systemsbiology.cau.edu.cn/PlantGSEA/ . 2016-11-20 New species Brassica napus, Sorghum bicolor, Gossypium hirsutum and Gossypium arboreum have been included to our server! 2016-01-10 New species Ricinus communis and Theobroma cacao has been included to our server, and we add PPI Cluster for Gossypium raimondii in our server! 2015-04-29 The PlantCyc gene sets of maize (MaizeCyc) has been updated to version 2.2. 2014-12-10 "Gene Family Based" gene sets and "MicroRNA Targets" gene sets in Gossypium raimondii(Cotton) are available now! 2014-12-01 New species Populus trichocarpa(Populus) has been included to our server. GO, Gene Family and KEGG categories are available for now. 2014-11-20 We have improved our program by letting user to choose whether to run overlap matrix if the query gene number is more than 500. 2013-12-16 The Christmas Day is coming, are you ready for your Christmas gifts? We wish you a Merry Christmas in advance! 2013-11-29 We've debuged some problems of running program and we hope you will contact us if you encounter any difficulties. 2013-07-02 The PlantGSEA toolkit was reported on a famous scientific website, GenomeWeb. For more detail, please click here. We've accomplished 63544 requests so far.